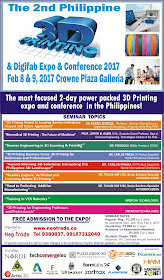 Learn all about 3D Printing at the 2nd Philippine 3D Printing and Digifab Conference! 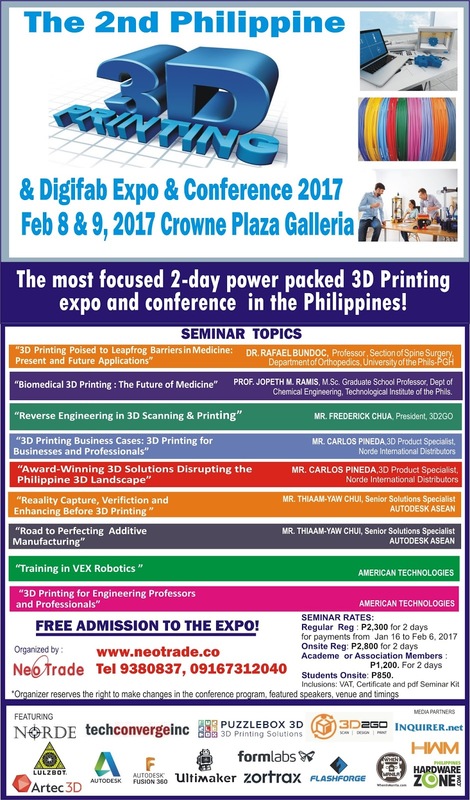 The popular exhibition and conference on 3D Printing is slated on Feb 8 & 9, 2017 at the Crowne Plaza Manila Galleria, Ortigas Center Quezon City and is organized by Neotrade Events. The Philippine 3D Printing and Digifab Expo and Conference is the premier exposition and conference focused on additive manufacturing and digital fabrication in the Philippines, anticipating the dawning of a new era in manufacturing. The conference will feature key players and experts in the field, who will talk about the basics and applications of 3D printing and how the technology affects the medical industry, building and construction, engineering, business and manufacturing sector and how it affects consumers. "3D Printing for Engineering Professors and Professionals,"
Invited to attend are : engineers, architects, industrial designers, SMEs, key players from the education sector, medical industry, creative arts, fashion industry, jewelry manufacturers, information technology industry, marketing specialists, hobbyists, direct consumers, students and others interested in attending this event that uniquely features a fusion of technology and creativity. The exhibition features the latest products, services and innovations and opportunities in digital fabrication, specifically 3D printing. For more info and to register for the conference, please log on to www.neotrade.co or email phil3dexpo@gmail.com or call 9380837 , 09167312040. **Organizer reserves the right to change the program topics, speakers, schedules and timings.